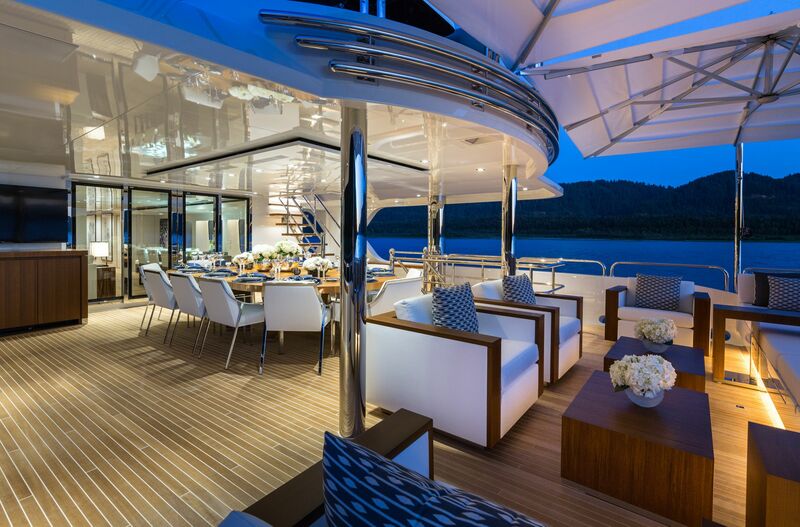 From USA-based shipyard Christensen comes the 48.8m/160ft CUSTOM LUXURY SUPERYACHT, a 2016-built vessel constructed with a GRP hull and superstructure. VARO Interior Design created her beautiful contemporary decor, from the shared areas to the six massive guest cabins that accommodate up to 12 charter guests. 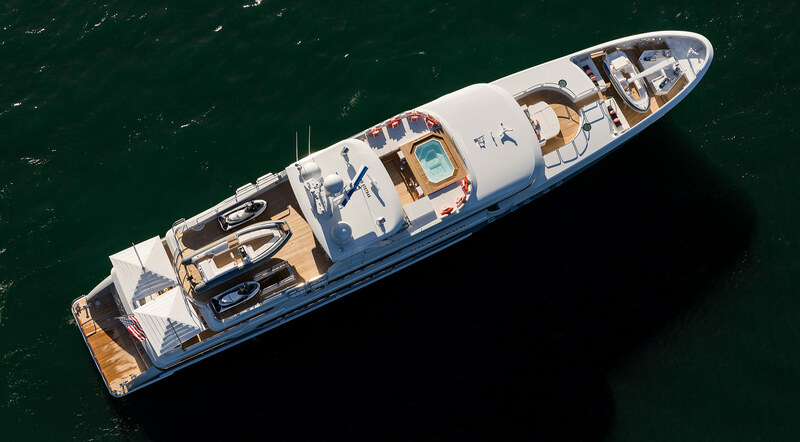 She is an outstanding charter yacht with plenty of top amenities and extras. 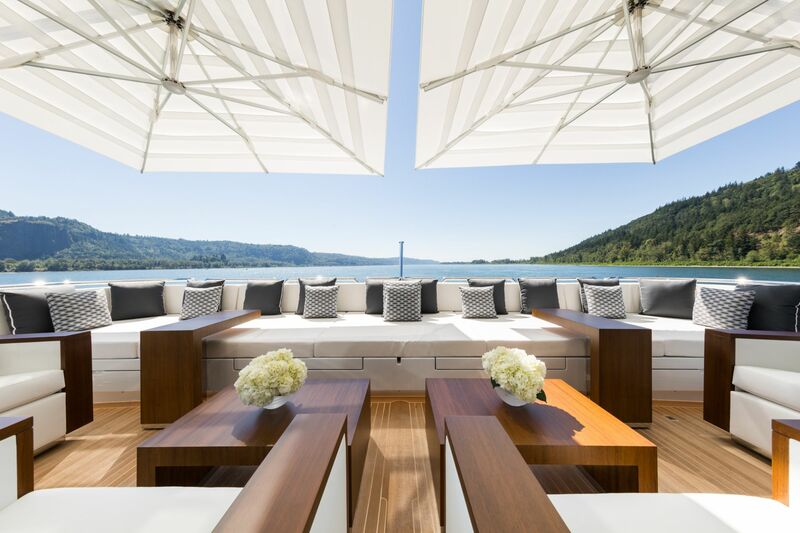 From the broad swim platform, guests can access the main deck aft, where they will find beautifully laid out alfresco lounge with orange accents against brown padded seats and drinks tables ideal for coffee mornings together or a nightcap under the stars. 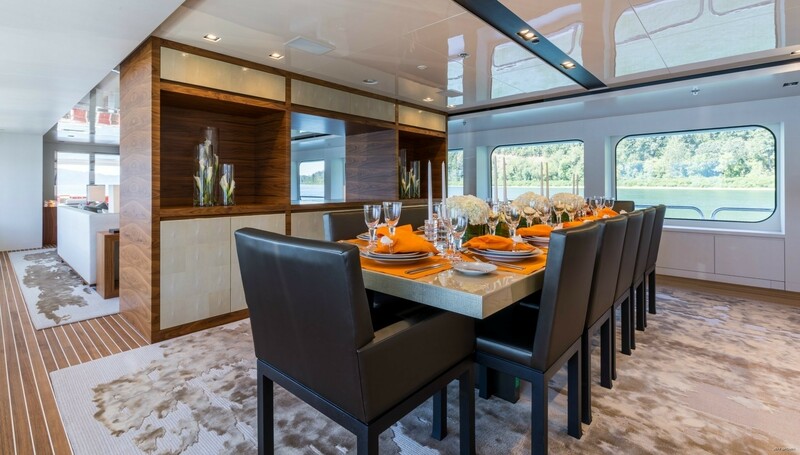 A drinks cabinet with a sink is situated on the port side and a starboard staircase provides quick access to the upper deck, which is dedicated to alfresco dining with a large oval table to seat up to 12 guests. 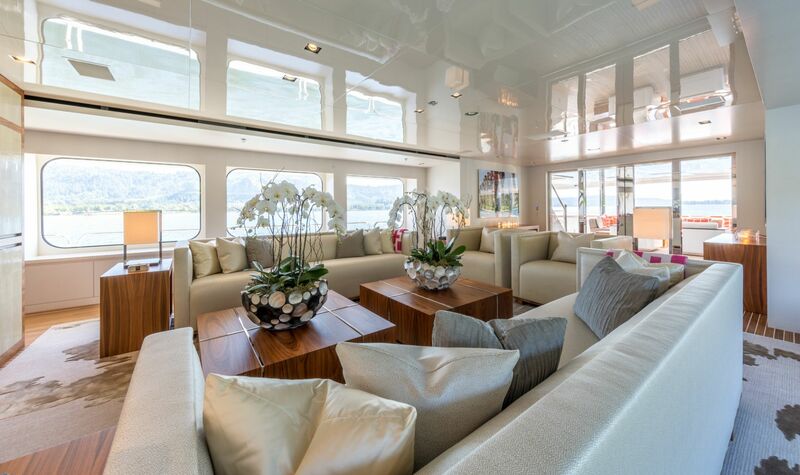 After a heavy meal, guests can lie back and relax on the sofa-sun pads along the stern, where large sun umbrellas offer shade if required. 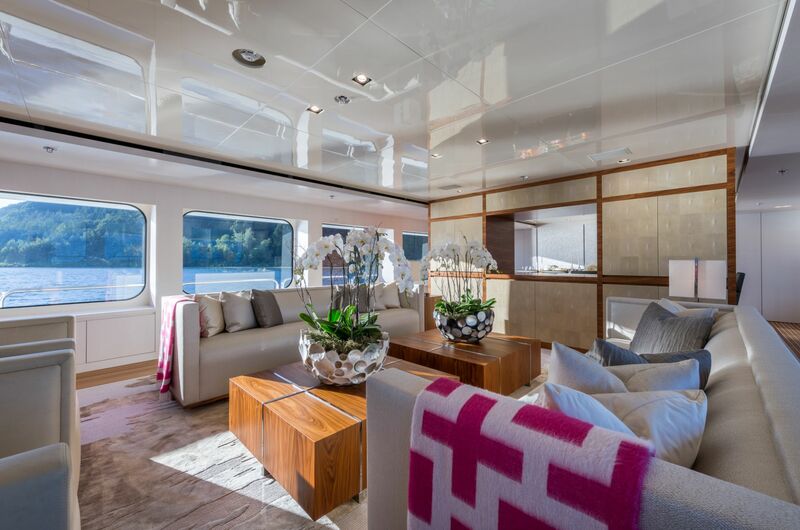 The Portuguese deck is fitted with a plush sun pad as well as foredeck seating, where guests can break off from the main group to take in the forward views and enjoy peace and quiet in the sunshine. 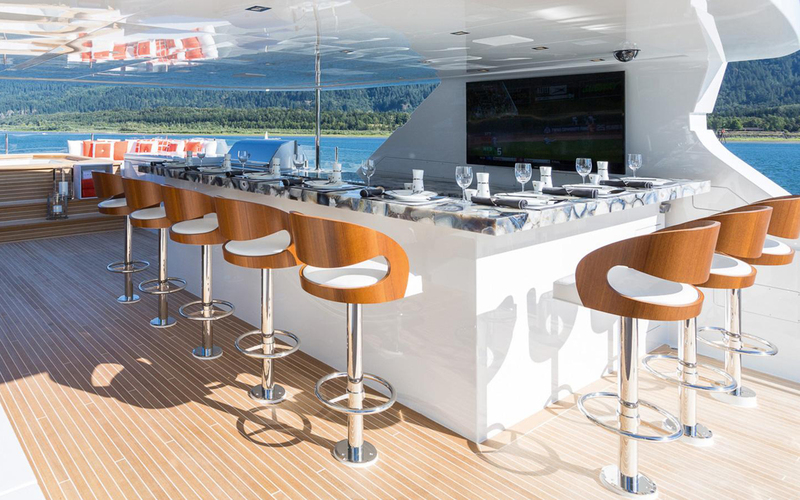 Above, the sundeck has a large space to the aft for sunbathing, while the shaded middle section contains a striking marble-top bar with a widescreen TV behind for guests to catch up on the latest sports while dining alfresco or relaxing in the casual C-shaped seating opposite. 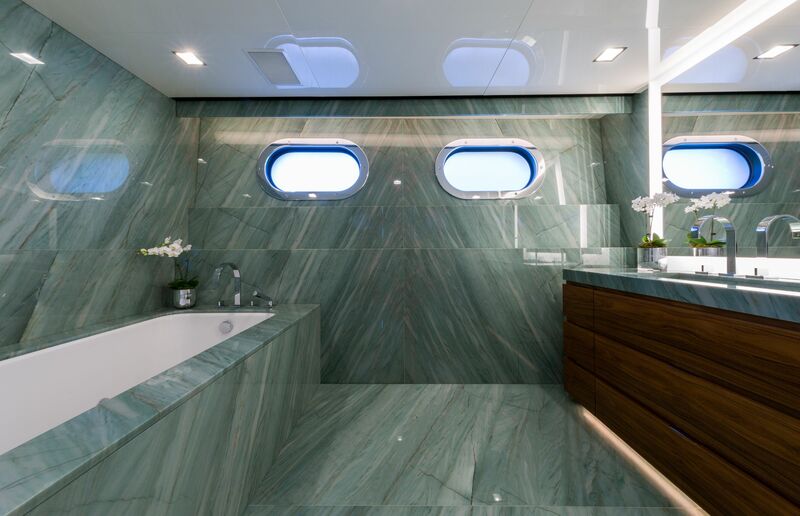 Forward, the raised Jacuzzi receives uninterrupted views of the scenery and sun pads either side are perfect for drying off in the sun. 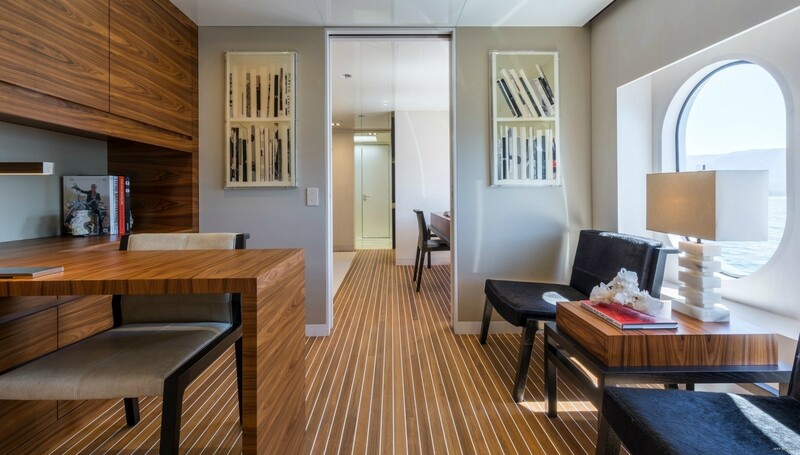 On the lower deck, the layout places the engines aft to leave the central section free for guest accommodation, consisting of three VIP staterooms - the aft-most containing a spacious bathtub in the en-suite - plus two double cabins forward of the foyer. 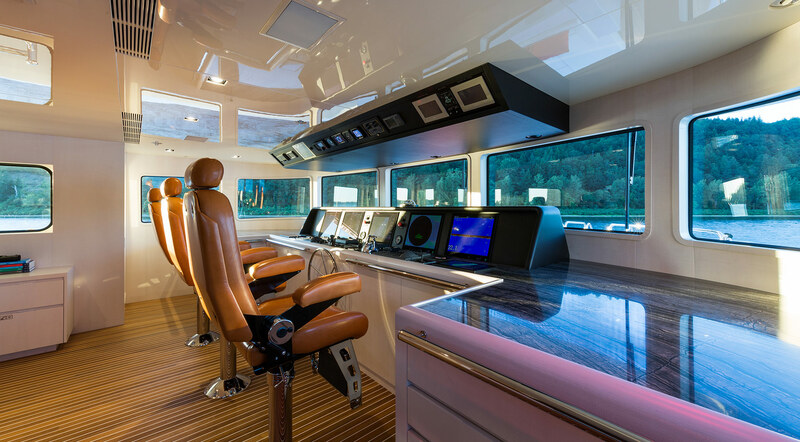 The crew accommodation and mess are placed in the bow. 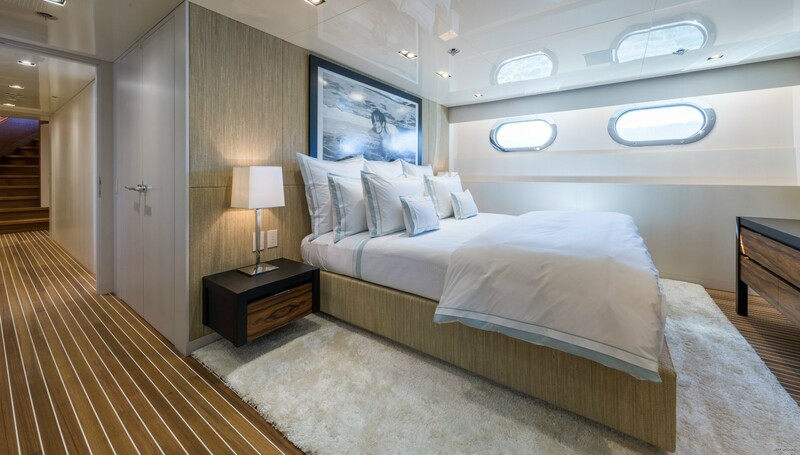 The main deck forward hosts the full-beam Master suite with a forward bathroom with his and hers sections and a double shower. 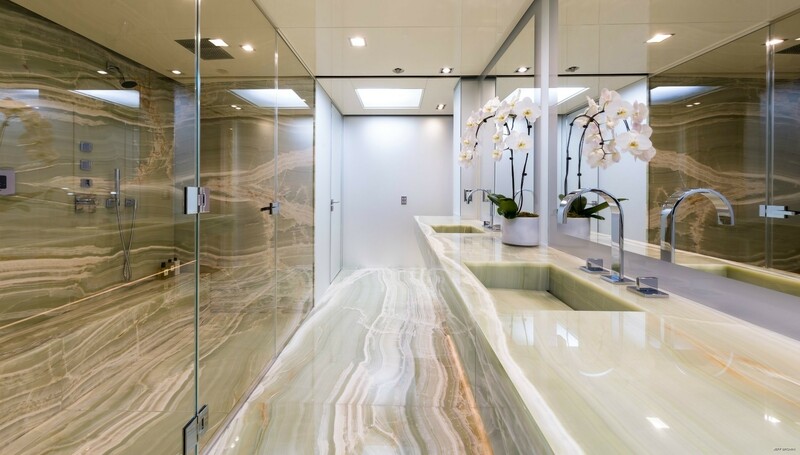 Two walk-in wardrobes, a work-space and a sofa complete the offerings in the Master suite, which is separated from the main foyer by a private lounge. 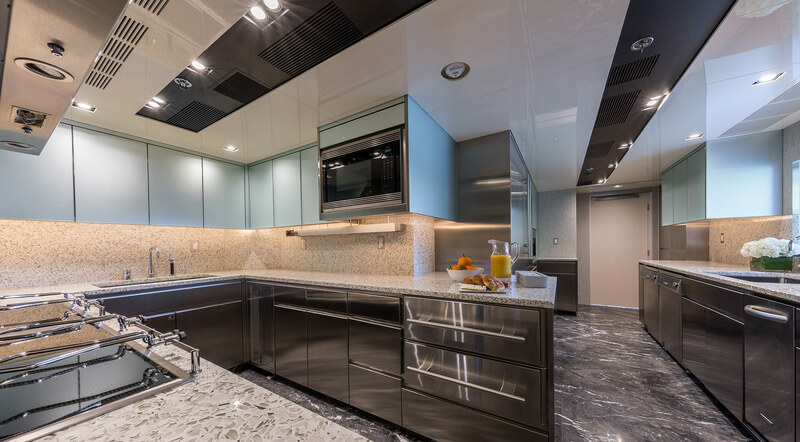 Behind, the modern formal dining area plays with light and texture for understated elegance. 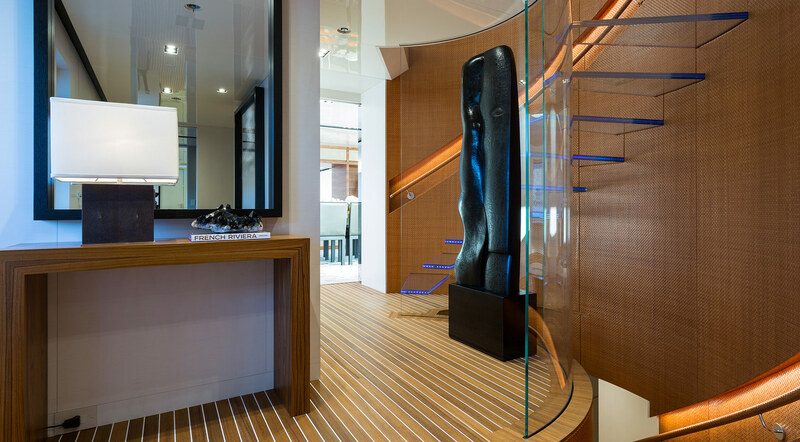 Seating up to 12 guests, a capiz door ensures a more intimate atmosphere for special occasions. The main salon behind receives plenty of natural light from the numerous windows, and a pale colour scheme of cream and silver complements the golden tones in the wooden furnishings. 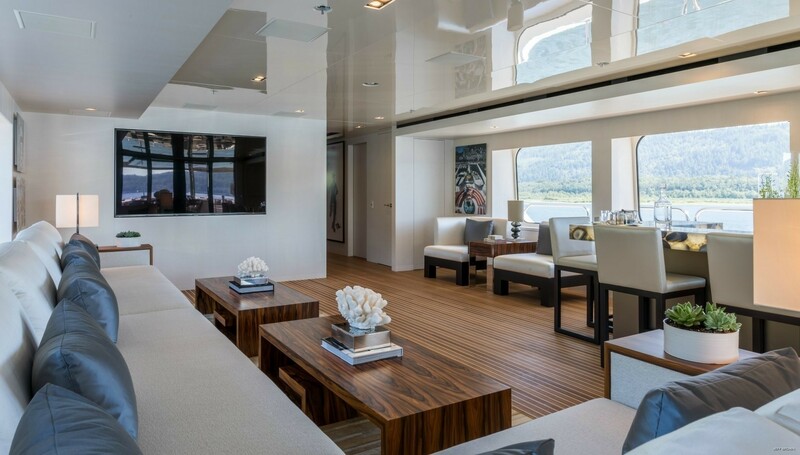 Above, the sky lounge aft of the helm station is both functional and chic for afternoons unwinding on the L-shaped sofa while watching a film on the widescreen TV, or for evening parties where the starboard bar adds to the evening ambience with a glowing tabletop and an excellent selection of spirits. 2 x Caterpillar 3512 Series engines produce a top speed of 17 knots, a cruising speed of 11 knots and a range of 4,175 nautical miles. 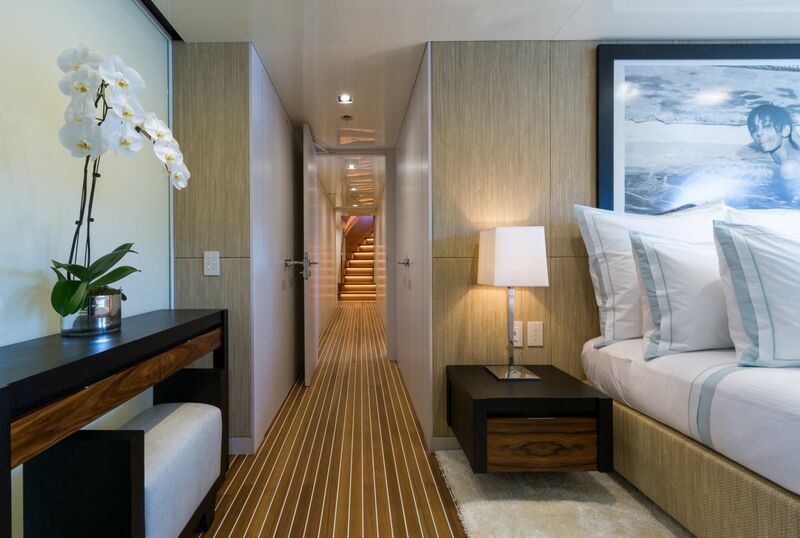 The accommodation sleeps a maximum of 12 charter guests over 6 cabins: 1 Master suite, 3 VIP staterooms and 2 double cabins with a Pullman berth, all with en-suite facilities. 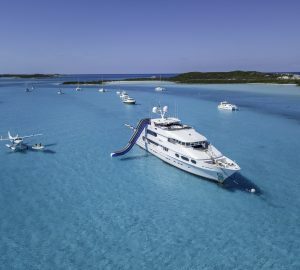 The crew of 10 will provide everything guest require for a relaxing and entertaining holiday amongst some of the world's most magnificent destinations. 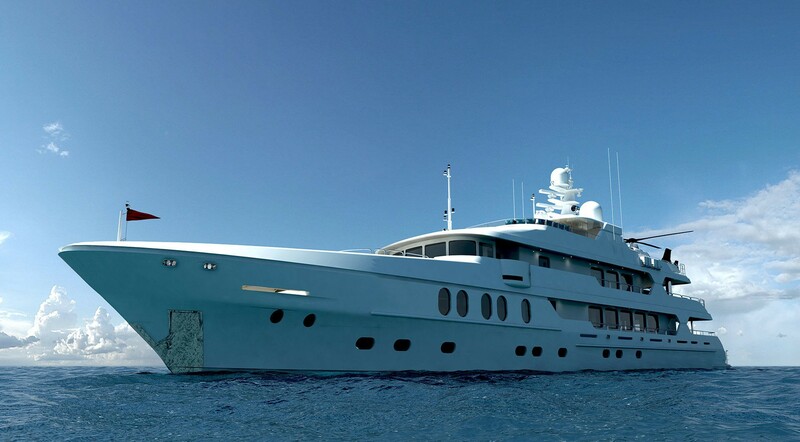 We do have available further amenity, owner and price information for the 48.80m (160' 1") yacht 49M CUSTOM LUXURY SUPERYACHT, so please enquire for more information.